The customer is an Australian ASX 100 company founded nearly 100 years ago and they are now recognized as an international leader in food ingredients and agribusiness. Throughout their operations, they focus on safety, sustainability and the environment; aiming to improve productivity and dispose of waste efficiently. The grain handling industry is a high hazard industry where fires and explosions can occur from grain dust accumulation. Over the last 35 years, there have been over 500 explosions in grain handling facilities globally, which have killed more than 180 people and injured more than 675.
motors, or misaligned conveyor belt). 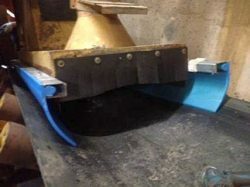 The customer was previously using a 1∕2 inch thick FRAS rated rubber (Fire Resistant Anti Static), necessary to comply with OHS regulations to avoid dust explosions. The rubber had developed memory fatigue, and was no longer rigid enough to conform to the belt sag between the idlers. As a result the customer was experiencing a lot of product escaping the skirting which was causing spillage. On average, skirting had to be changed every 2 years. Photo of Snap-Loc installed around the transfer point. The blue polyurethane indicates the Flame Resistant, Anti-Static (FRAS) properties. Ongoing improvements to the preservation of the belt itself because materials don’t collect under the slippery surface of Snap-Loc’s polyurethane, potentially causing damage to the belt. United States and weighed the benefits of FRAS for safety against not using this formulation.